Doctors prescribe iron supplements for iron-deficiency anemia, which can develop when significant blood loss occurs or as a result of certain conditions or diseases such as heavy menstrual periods, pregnancy, Crohn's disease or kidney failure. Often, a complication of taking iron pills is constipation but there are some things you can do to avoid the discomfort you might experience. Your body needs iron to help produce hemoglobin in red blood cells needed to carry oxygen throughout your body. In order to reduce the risk of a deficiency and needing iron supplements, strive for the recommended daily intake — 8 mg for adult men to age 50 and 18 mg for women. Certain conditions may put you at risk for not having enough iron and may lead to iron-deficiency anemia. Iron-deficiency anemia often affects women during pregnancy. Office on Women's Health report as many as 5 percent of women of childbearing age have an iron deficiency. NIH recommends a daily intake of 27 mg daily for pregnant women to support the development of your unborn baby. If you experience heavy menstrual periods, you may also be at risk for iron deficiency anemia and require iron supplements. Eating iron-rich foods in your diet is the best way to avoid an iron deficiency and constipation from having to take iron pills. The Academy of Nutrition and Dietetics says your body absorbs two to three times more iron from animal sources than from plants. 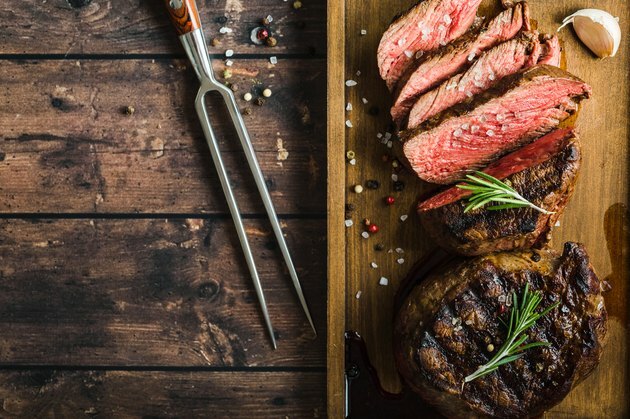 Foods with the highest content of iron include lean beef, turkey, chicken and oysters. If you are a vegetarian who does not eat meat, fish or poultry, the National Institute of Health suggests you need 1.8 times the recommended dietary allowance. The reason is you're getting your iron from plants in the form of non-heme iron that your body doesn't absorb as well as heme iron from animal foods. Good sources of iron for vegetarians include beans, dark green leafy vegetables, tofu, whole grains and nuts. Adding a source of vitamin C will enhance the absorption of iron. If you require an iron supplement, many kinds are available and most deliver more than the DV for iron. The most common form of iron supplements is derived from ferric iron salts, such as ferrous sulfate, and ferrous gluconate. However you are more likely to experience the side effect of constipation from iron supplements in this form. To help remedy constipation from iron tablets, drink a full 8-ounce glass of water or orange juice with each iron pill to provide your intestines with the fluids necessary to produce softer stools. An added benefit to drinking orange juice is that it contains vitamin C that helps with the absorption of iron. When vitamin C is consumed at the same time as iron, the two combine to form iron chelate, a complex that increases solubility of iron in the small intestine. You will get the most benefit from taking 500 mg of vitamin C along with your supplement, according to University of Washington Medical Center. To help alleviate constipation from iron supplements, begin taking your pills at half-dose and gradually increase the dosage every three days until you reach the full dosage. It's best to separate your dosage into three smaller daily doses to reduce the likelihood of constipation. Exercise each day to stimulate healthy bowel movements. Try physical activities such as walking, 20 minutes of light aerobics or a bike ride. Take a stool softener when needed to relieve constipation. Stool softeners increase the water content in stool, making them softer and easier to pass during bowel movements says University of Washington Medical Center. Eat more fruits and vegetables. They are rich in fiber which adds bulk to stools, making them easier to pass during bowel movements. The U.S. Department of Agriculture Food Pyramid recommends eating two to four servings of fruit and three to five servings of vegetables each day. To prevent overdose, never take more than the recommended dose of iron without permission from your doctor. Iron blocks the absorption of some antibiotics. Inform your doctor that you are taking iron supplements before taking antibiotics. Your doctor may prescribe a different antibiotic or recommend that you temporarily discontinue the use of iron supplements during the duration of your antibiotic cycle. It is normal to have black stools from iron supplements but see a doctor if you experience red streaks in your stools, have abdominal cramps or sharp abdominal pains.